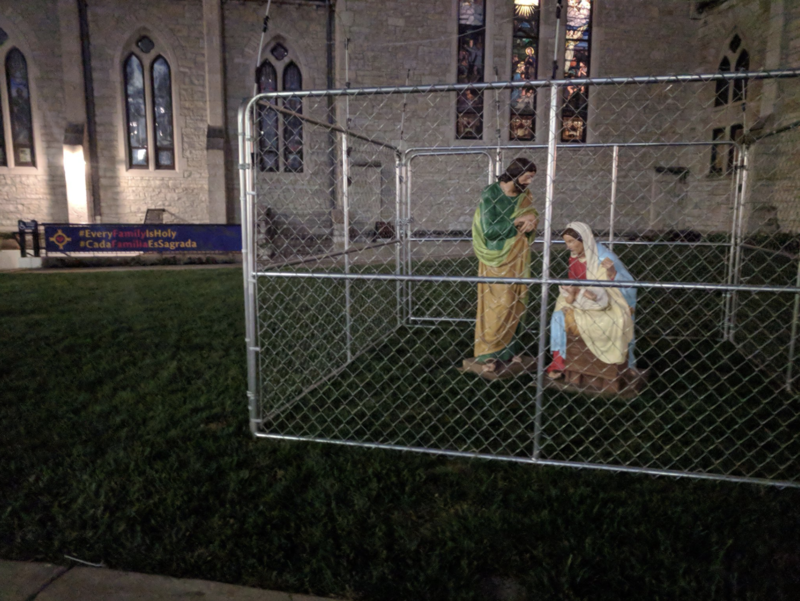 A congregation in Indiana has placed Mary, Joseph and baby Jesus statues inside a cage on a church's front lawn. Christ Church Cathedral says the Holy Family has been placed in "ICE detention," a poignant statement on immigration that has gained widespread attention. The caged Holy Family is part of the church's "Every Family is Holy" campaign. The church, located in Indianapolis, says just like immigrants crossing the border, Mary, Joseph and Jesus were once homeless and fled danger to seek asylum. The church's dean and rector, Steve Carlsen, says the "Holy Scripture is clear about how we are to treat people trying to find safety for their families -- we are to show mercy and welcome them." The campaign aims to "bring awareness to the humanitarian atrocities from our nation's 'zero tolerance' immigration policies," the church says in a statement. Carlsen told CBS News the idea to put Mary, Joseph and Jesus in a cage came from an associate clergy member at the church, Cannon Lee Curtis. He had an idea to use the same images displayed at Christmas time -- Mary, Joseph and Jesus -- but to put them in a "detention center," Carlsen says. "[Some] forget that this is a homeless family with nowhere to go," Carlsen says. The story of the Holy Family teaches that "the heart of God is with those who are most vulnerable, most at risk," like immigrants and refugees, Carlsen says. Carlsen knew the church lawn, which "faces the most public space in Indiana," was a huge platform for their campaign. "We put it up last night and we finished around 10 p.m. We wanted people to see it as we were coming to work." The priest says the display got immediate attention. Just after it was placed on the lawn, a man walking by asked Carlsen about it. "He asked what it means, I said, 'Think about it a little bit.' And then I saw the lightbulb come on." Photos of the display show a statue of Joseph looking down on a statue of Mary, holding baby Jesus. It is similar to a manger scene, except the family is surround by a small chain link fence. The fence resembles those seen in some detention centers near the border, where some families who were separated at the border are detained. Behind the cage is a sign with the campaign name, written in both English and Spanish. "When we say 'every family' we mean families on the border," Carlsen says. "We have been active as a church caring for those in need -- including people who are coming to our country, seeking a better, safer life for themselves and their kids." He says the display has already made a strong visual impact and it will stay up for as long as they feel needed. "How long is it needed? My greatest hope is that those in power, those who could end this today, will say 'We are not going to treat people coming into our country this way,'" the priest says. As for those who do not support the strong visual of Mary, Joseph and Jesus in a cage, Carlsen has a simple answer: "If it offends people, I think it might be God trying to get their attention."